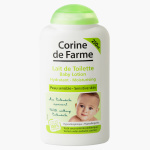 Corine de Farme Baby Lotion Natural Origin - 250 ml | Multicolour | Baby lotion gently cleans and moisturizes all skin types, even sensitive skin. Use this lotion to nourish your baby's skin and ensure it becomes softer. It has organic calendula that helps in smoothening and leaving the child's body with a delightful scent.